Sairee Cottage Diving Koh Tao is an eco friendly dive school. We are dedicated to marine conservation and education. Our staff are passionate about the ocean and will sit and chat with our divers about how to inspire others to protect our ocean. We train eco friendly divers. As divers we all are ambassadors for our ocean. We believe it is every diver’s duty to make a change and inspire others to do the same. Sairee Cottage Diving Koh Tao has the 100% AWARE rating. 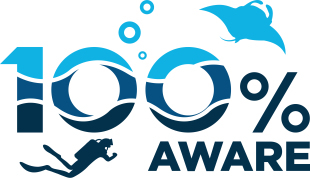 Eco friendly dive schools around the world can achieve the 100% AWARE rating through the ProjectAWARE organisation. We encourage you to choose dive schools that have the 100% AWARE rating. Ask them questions about their eco programs and marine conservation efforts. You can verify this rating on this interactive map. PADI Open Water divers have the option to donate to ProjectAWARE and receive a certification card with an awesome picture. At Sairee Cottage Diving, every student that we certify will receive a 100% AWARE certification card. We donate monthly to ProjectAWARE on all of our student’s behalf. Eco Shirt – Will You Let Our Ocean Flatline? On a day off from diving, recently certified Dive Instructor Lionel designed a graphic for the back of our green t-shirts. Hundreds of these t-shirts have already been sold to fun divers and students since we printed them. 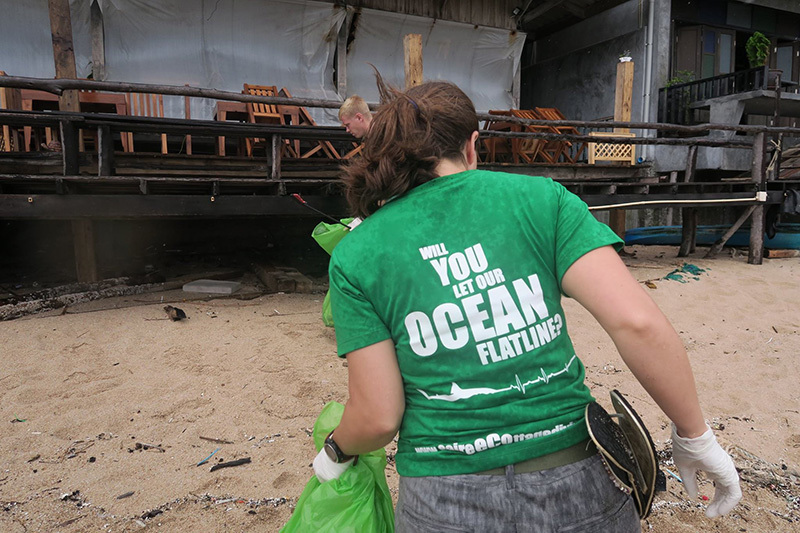 We donate the proceeds of these t-shirts to ProjectAWARE. It conveys our eco friendly attitude and has inspired many people to pass on the message. Kaylie, one of our Head Divemasters, has a tattoo of the image on her arm. We know of at least one of our students that was inspired and also has the image tattooed on her arm! Apart from inspiring other divers to protect our ocean and make eco friendly choices, we also actively participate. We run regular clean-up dives, beach clean-ups and CoralWatch surveys. 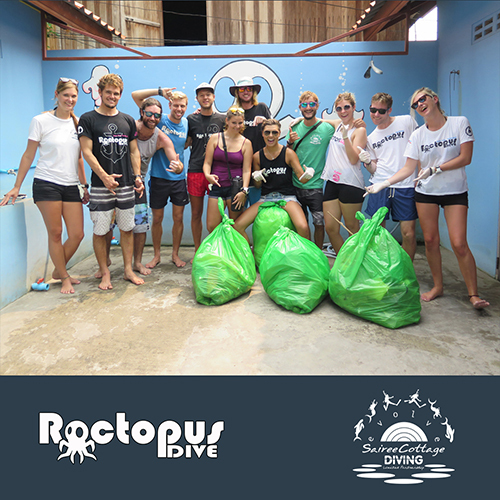 Once a month we collaborate with Roctopus Dive in organising and holding an eco day. Divemaster Trainees, MSDT candidates and all staff members are encouraged to participate. There are a few eco lectures in the morning, aimed to educate everyone on marine conservation. In the afternoon, mixed groups from both dive centers split up and one group does a clean-up dive, one group a CoralWatch survey and the third group a beach clean-up. It is a great way to bring dive centers together and work on preserving our ocean.